Austrian born singer-songwriter, violinist, Building Bridges founder and former Rotary Ambassadorial Scholar Roswitha celebrates world premiere of her DESTINY album, which made it into several categories of the 56th Grammy ballots: CD Release Party at the Metropolitan Room to benefit New York City youth leadership organization Rock Ur Heart Out, November 18th 2013, 9.30pm. 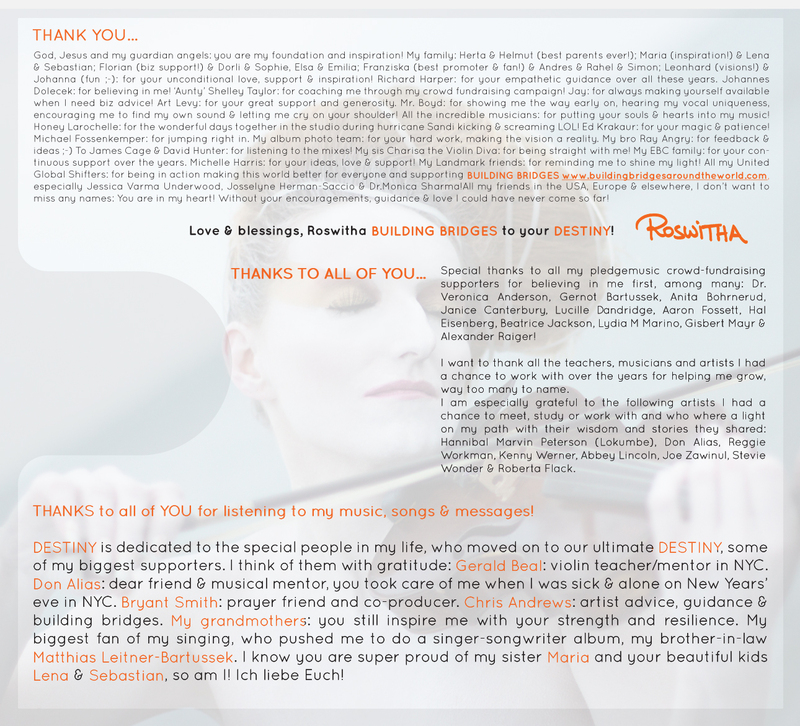 "Provocative soul and burning lyrics meet sensual driving violins," Roswitha on stage at the Metropolitan Room Nov.18th, DESTINY album CD Release Show "Sade, Sia & Florence and the Machine + a violin in her hand!" 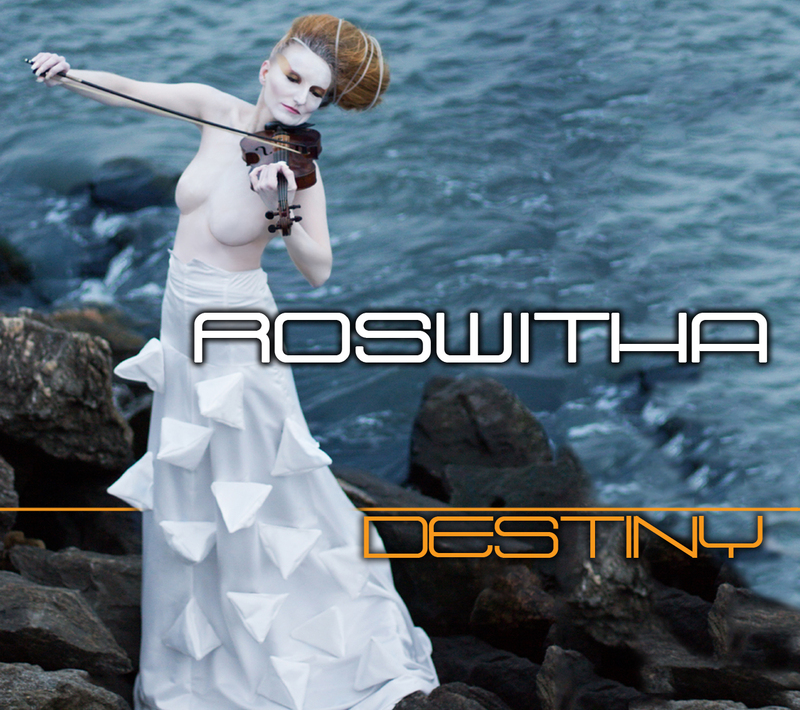 Roswitha - "A Global Citizen Building Bridges to your DESTINY and shifting systems" - premiers her DESTINY album to benefit New York City youth leadership organization Rock Ur Heart Out at the renowned Metropolitan Room. 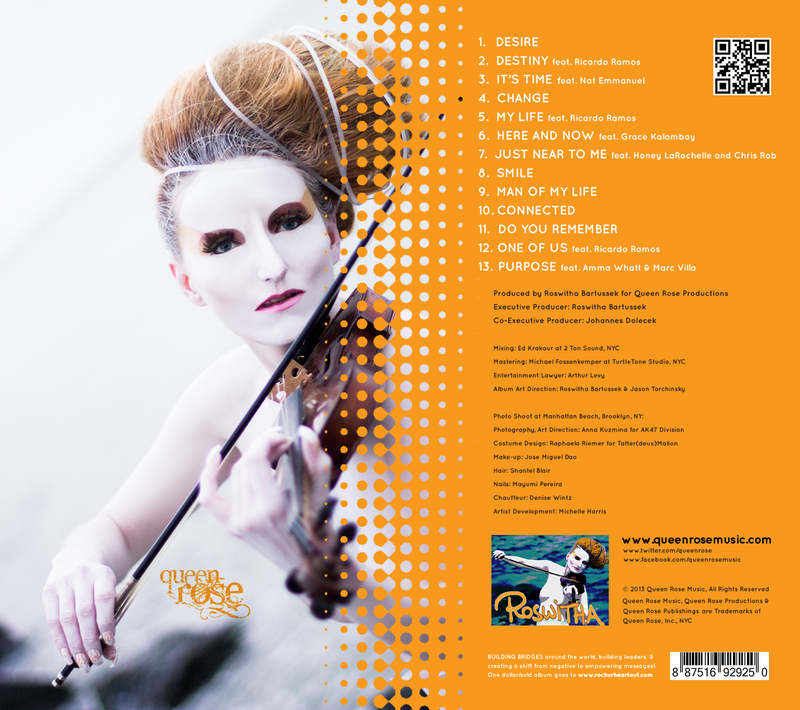 "Provocative soul and burning lyrics meet sensual driving violins," the album got listed in several Grammy categories for consideration for a nomination. 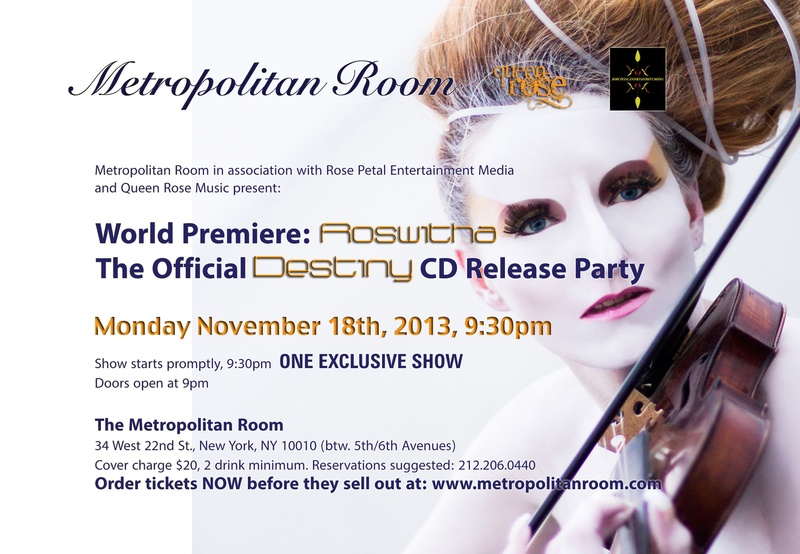 The Metropolitan Room in association with Rose Petal Entertainment Media and Queen Rose Music are proud to announce the official CD release party and world premiere of DESTINY, the latest album from music producer, singer-songwriter and violinist, Roswitha. 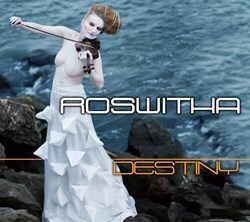 Known as a renowned jazz and classical artist, Roswitha made a bold step out into the world as a singer-songwriter. Her new album DESTINY has garnered favorable comparisons to such diverse artists as Björk, Sia, Sade, Florence and the Machine, Amy Winehouse, Adele, Tracy Chapman, Stevie Nicks, Les Nubians, and Zap Mama. DESTINY combines all facets of her creativity—her brilliant violin playing, smoldering vocals, uplifting songs, and her refined production aesthetic. It is an elegant blend of jazz, classical, R&B, hip-hop, rock and pop that showcases her gorgeous compositions and soulfully angelic vocals. DESTINY made it onto the 56th GRAMMY ballots for Album of the Year, Best New Artist, Best Pop Vocal Album & Best Engineered Album, Non-classical. Several songs made it into Record of the Year, Song of the Year, Best Pop Solo Performance, Best Pop Duo/Group Performance, Best Gospel/Contemporary Christian Music Performance & Best Contemporary Christian Music Song. 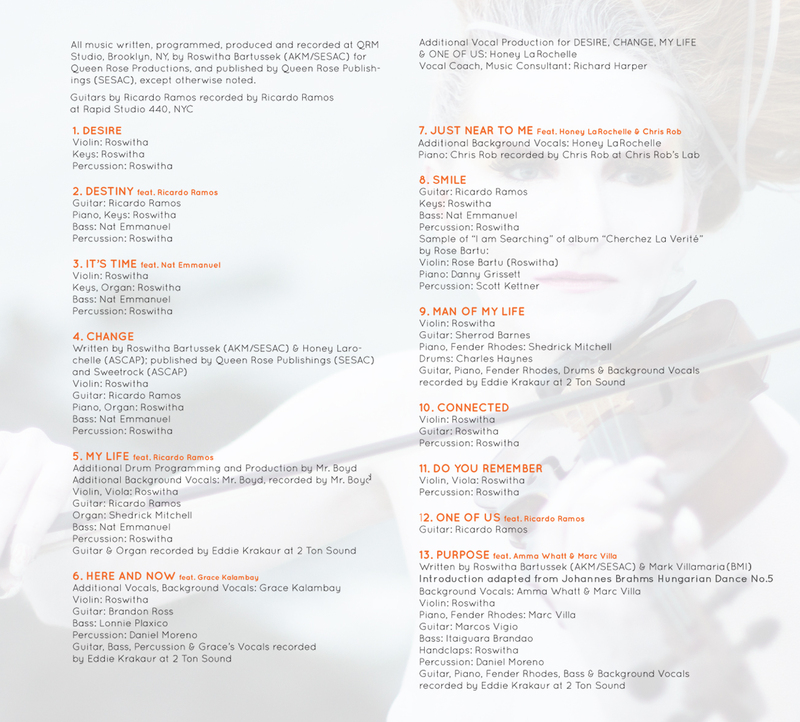 Selections of the album will be performed with live band at The Metropolitan Room on Monday, November 18, 2013 at 9.30pm. Tickets should be pre-purchased here. Roswitha organically inhabits a broad array of styles, tying them together with her euphoric and liberating message. “The general theme is to live your dreams; free yourself from any external influences and seek answers from within,” explains Roswitha - an artist who continues to dream and speaks to the responsibilities of musical creativity, entrepreneurship, personal integrity, and making a social impact which extends beyond her music. She wrote the song “One of Us”, her anthem against guns, after Trayvon Martin was killed. Roswitha is a mission-driven artist. $1 from all DESTINY sales and a portion of all proceeds from her Metropolitan Room appearance will be donated through her own organization, Building Bridges, to Rock Your Heart Out, a youth music leadership program administered by Windows of Opportunity. These contributions will support an on-site music studio for at-risk and under-served youth in New York City. The show date incidentally coincides with what would have been the 60th birthday of Barbara Harmon, the aunt of Windows of Opportunity founder Hal Eisenberg, who named his organization “The Barbara Harmon Institute”. She was a nurse who dedicated herself to the 9/11 relief efforts and died of health issues as a result of that commitment.